1920 was the first year that license plates were produced in the Connecticut prison system. These plates were embossed steel, and the length of the plate varied with the number of digits. A letter prefix came into use in 1924, to keep the length of the plates down. The letter can be used to determine where in the state the plate was likely issued from. 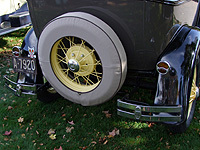 From 1926 through 1931, the only major variation in the design of the plates was the annual change in colors. In 1932, smaller 6 x 9-1/4 plates came into use. Every passenger car plate was now the same size. Two stacked prefix letters followed by one to three numbers was now the standard format. Older all-numeric plates with one to four numbers, and those with single letters followed by one to three numbers were continued on these new plates. Colors changed every year through 1936. The top letter continued to indicate where in the state the plate was issued. In 1937, motorists received new ‘permanent’ plates. The plates were made of a thick aluminum with black paint on the embossed areas. These were the same size and numbering format as the prior year’s plates, but had a space in the bottom center where a replacable date tab indicating the year of validity was inserted. This date tab indicated the last 2 digits of the year of use, and the colors of this tab changed every year. The tabs were made of a thin, brittle metal, so that the mounting ears would break off if the tab was removed from the plate for reuse elsewhere. This plate was used for 10 years, through 1947. 1931 was the last year for these long plates. it was issued from the Hartford DMV Office. This is an optional plate which was available to be displayed on the front of the vehicle for the year. New ‘Permanent’ aluminum base with replaceable renewal tabs.